Right now the fields here in Vermont are bursting with gorgeous ripe tomatoes, eggplant, and basil so this dish is actually 90% locally sourced! 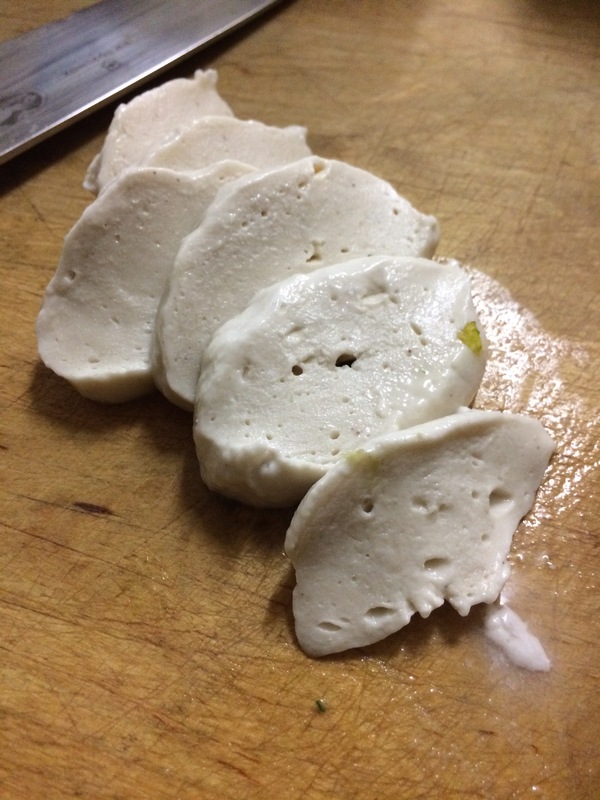 It comes together pretty quickly, the only thing is you should make the mozzarella a day ahead so it has time to firm up in the refrigerator. For the mozzarella you will need a high speed blender, sauce pan and a wooden fork, or spoon. 1. Blend until smooth and creamy. Add to a sauce pan. Turn to medium low. 2. Stir constantly until it’s thick and stretchy. 3. 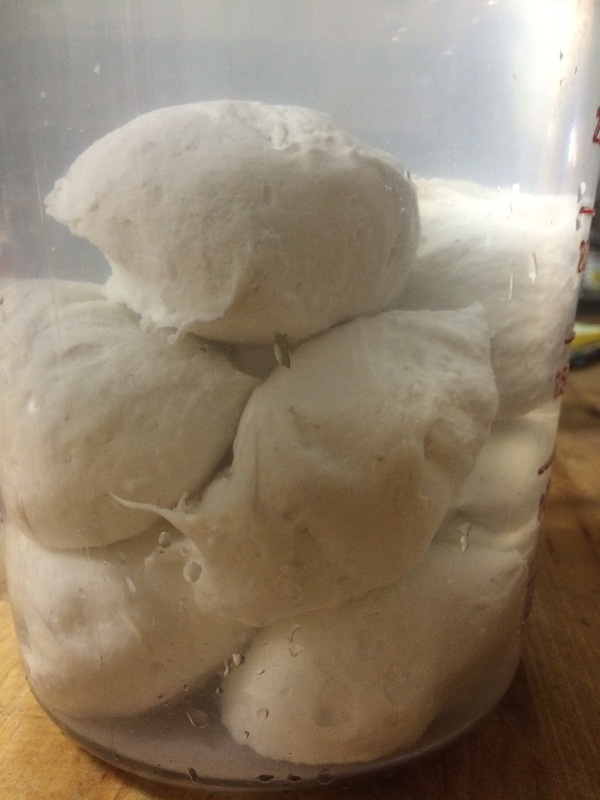 Using an ice cream scoop, scoop cheese balls out of the sauce pan and float in the ice water. Repeat until all the cheese is made into balls. Keep in the refrigerator overnight. 2 long and slender eggplant, sliced 1/2″ thick. It’s Your choice to leave the skin on or not. 1. 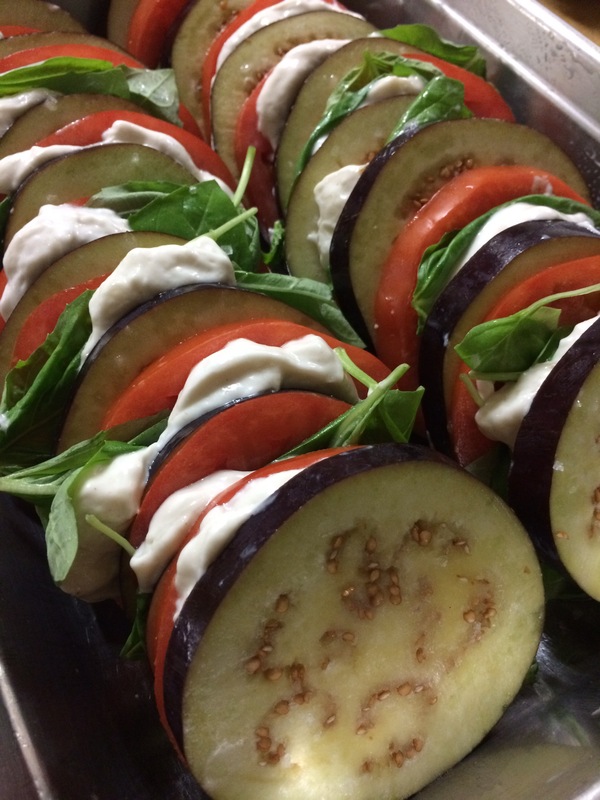 Slice the eggplant and brush with a neutral oil like safflower or grapeseed, sprinkle with sea salt. 3. Remove basil leaves from the stems. 6. 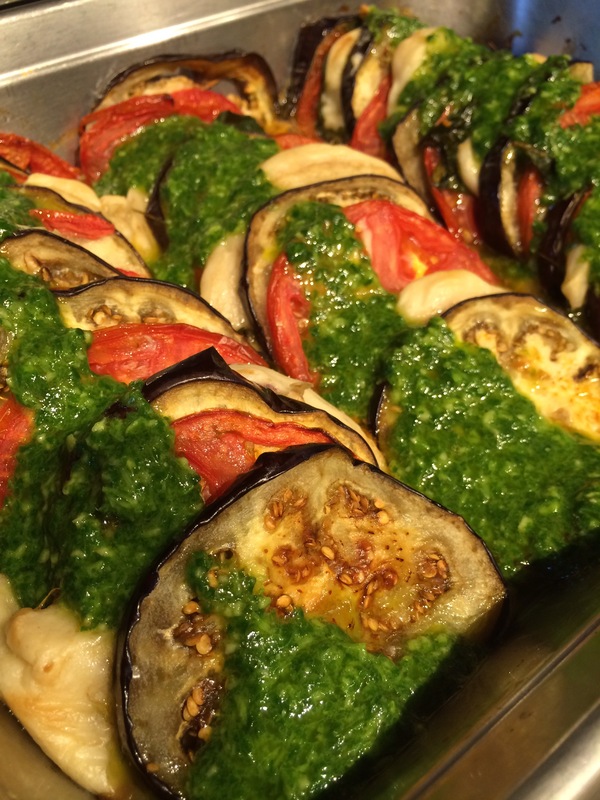 In a baking dish 9×11 alternate rows of eggplant, tomato, basil, mozzarella until you have used everything up. Bake uncovered for 40 minutes, brush the top of the eggplant with a little oil if it starts to look dry. 1. In a food processor add the garlic, basil, and lemon juice and process for a few seconds. Stop the machine and scrape down the bowl. Start in again and add the salt and drizzle in the oil. 2. When the Caprese is done drizzle the oil over the top. Previous PostPrevious Raw Vegan Cheezecake Sandwich Cookies!! Next PostNext Vegan Summer Plum Crisp!